There’s not a lot that will drag me out to Oakland late on a Tuesday night. Especially when a new Glee is on, but when I heard that Thao Nguyen and Mirah were playing together at the New Parish, well that made the BART ride not seems so long or stinky. It turns out that a lot of fans had the same minds set. The place was packed, up stairs and down. It makes sense as Thao & Mirah’s combined forces are quite a site to see. 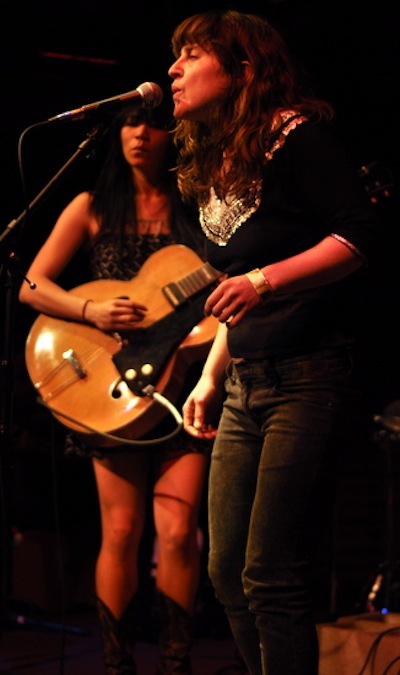 Mirah even mentioned during the show that the tour had adopted the name “The Pleasant Surprises” tour, which could be used to describe the collaboration between the two singer songwriters. There wasn’t ever a question as to whether this all star duo would be good, but, at least in my opinion, the two already have very similar sounds, so how was a collab going to be distinguished from the other’s respective projects? 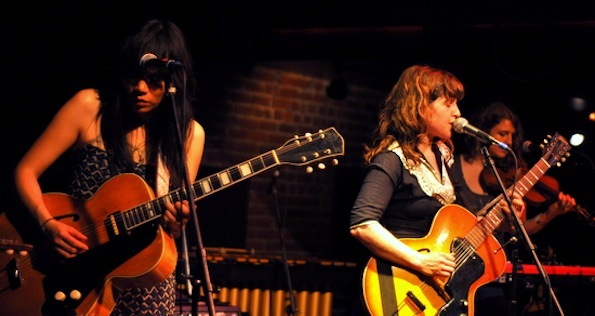 They manage to pull it off, on their recently released album, Thao & Mirah , and especially on stage. They create an Americana, folk whirlwind, combining Mirah’s classic vocals and Thao’s avant style and guitar work, a brilliant blending of both personas. When the two ladies and their band took the stage Tuesday night, it was immediately obvious that this was going to be a great show. There was a playful vibe from the get go and the audience could tell that the two genuinely enjoy working together. This is not a gimmick to sell more records. They are like two friends playing in their parents’ garage just for the sheer joy of it. The second giveaway that this was going to be an amazing experience was the myriad of instruments littering the stage: multiple guitars, keyboards, a violin, a slide guitar, a xylophone, a drum kit with a heavenly display of non-traditional symbols aside from the traditional units and a sea of otherwise ear rattling noise makers. Even when the song didn’t require a band member to play an instrument, they would clap their hands, Mirah and the band’s drummer even played a hand clapping/knee slapping game during one of the songs. The 5 piece band gleefully frolicked through almost their entire album, stopping periodically to chat with the audience, making the already intimate venue seem like being at a dear friend’s house. The two musical styles of Thao and Mirah blend together perfectly, but on stage their differences in personality are apparent and very complimentary in their opposition. Mirah is classic and holds her composure on stage with an understated elegance. Thao, on the other hand, is a wild woman onstage and rarely stayed by the microphone even when singing. She danced around the stage as if the music had a hold of her. This can be heard in their singing as well. Mirah has a beautiful, classic voice and Thao has a deeper less traditional style which makes their album and live performance that much more unique and special. When the two come together to go head to head on guitar, that’s when the sparks really fly. They are both talented and precise guitar players. Watching their fingers dance around the frets is a think of beauty. It’s just another example of why this is more than just a novelty act fronted by two notable names in the music scene. They are both extremely talented and they work very well together. 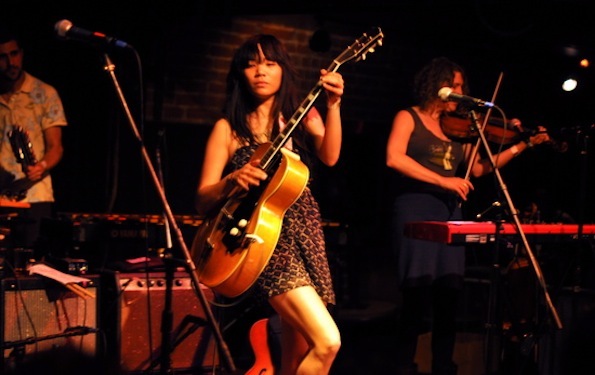 Bay area fans have a second chance to catch Thao and Mirah when they hit the Great American Music all on June 23rd. Until then, their album should be playing on repeat.